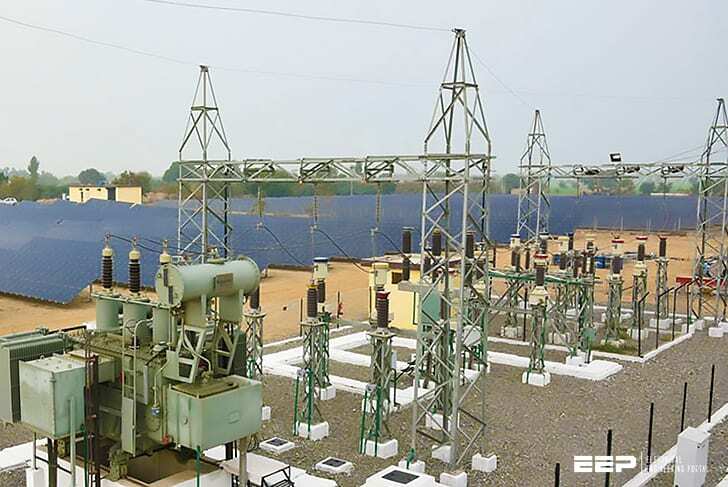 A solar (PV) plant consisting of arrays will output power to a grid-tied power substation. The output of the plant is 60 MW. The solar power plant will produce DC current which is routed through a set of series/parallel conductors to an inverter. The inverter outputs three phase AC current to a step-up transformer. The step-up transformer outputs to a collector in the substation component, in which flows to the collector arrangement, feeder arrangement and key protection component. Finally, it is fed to the grid at 115 kV. The purpose of the substation is to collect all solar array power and feed into the grid after stepping up voltage to distribution level. This substation is based on an Arcadia design, modified for the project. Power flow is bottom to top, 34.5 kV bus to 115 kV bus. It will consist of the following major drawings (single-line drawings). Collector – Input from solar arrays’ transformer. Feeder – Output from collector, input to 34.5 kV bus. Key Protection – Circuit breakers, protection relays, capacitor bank, and step-up transformer. Outputs to grid at 115 kV. The power flow block diagram in Figure 1 shows the input current flow from array skids. Array skids contain the inverter and step-up transformer. Power flow is bottom to top. Current Transformer (CT) – Drops current to manageable level for relay, usually between 1 and 5 amps. Circuit Breakers – A device in key protection that opens the feeder switch when relay detects an overcurrent condition. Relays – Relays are monitoring devices used to detect ground fault currents and reduce saturation. If there is an overcurrent fault they command the circuit breakers to open the circuit. Once current reverts to normal level, the relay will command the circuit breaker closed. Capacitor Bank – The 9.0 MVAR capacitor bank stabilizes harmonics associated with threephase currents and helps maintain a power factor of 0.95. 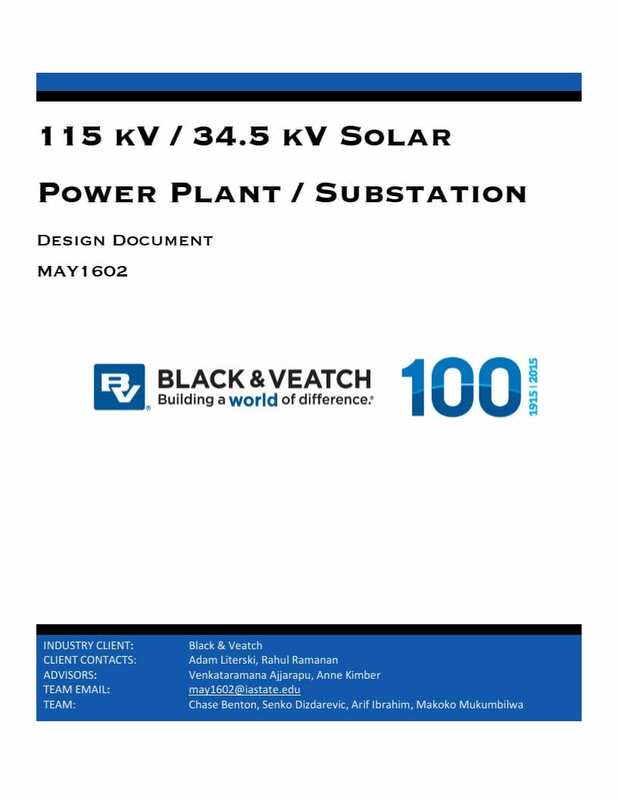 Component specifications were provided by utility and Black & Veatch. Surge Arrestor – Surge Arrestors are devices that are used to maintain equipment protected from overvoltage transients caused by lightning strikes, or switching over voltages within the substation itself. In this project they are used to protect the four terminals going into each of the three feeder transmission lines. 1)In the single line diagram circuit breakers,P.T.s,L.As,Isolators,capacitor banks, auxilary transformer are not shown. 2)Capacitors,I think, are required to correct the inductive KVAr of the load system.For 85 MVA load PTR,more than 9 MVAr is required. 3)CTs and PTs are used both for metering and protection.